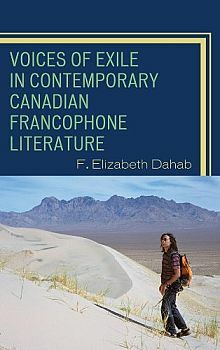 In Voices of Exile in Contemporary Canadian Francophone Literature, Elizabeth Dahab introduces readers to a relatively unexamined field of Canadian literature – Québécois writers of Arabic origin – a field she describes as “weakly institutionalized and largely unknown to mainstream scholarship” (vii). Voices of Exile contains six chapters: an introduction and five comprehensive, descriptive analyses of five Canadian-Arabic writers, four men and one woman. Before moving to in-depth discussions of individual authors, Dahab carefully contextualizes the francophone writing she will explore, arguing that what this literature shares is “the indelible mark of exile” (ix). In an introduction titled “The Odyssey of Québécois/Canadian-Arabic Writers,” Dahab delineates the objectives of her study. The first is to clarify her choice of Québec as the site of her study, and in doing so problematize the term francophonie, and the relationship between minor literatures of Québec and Québécois traditional literature. The second is to trace the field itself. Dahab accomplishes this by providing relevant demographic information about the Canadian-Arabic community; by summarizing the writers and their work; by tabulating authors, their locations, genres, and awards (12-16); and by demonstrating the reception of this literature in Québec. Introducing these broad objectives, Dahab also establishes the field of theories and theorists that will inform her analyses. They include Seigfried Schmidt, Jean Sgard, Deleuze and Guatarri, and Edward Saïd. While Dahab defines her approach as New Critical, there is much poststructuralist and politicized theory applied, and “minor literature” as defined by Deleuze and Guatarri underscores the entire study. Dahab’s introduction finally names the project of “detect[ing] tendencies in Arabic-Canadian writing” (2), following a more substantial account of historical context and theoretical framework in Chapter One, and this project organizes her focused analyses of writing from representative Canadian-Arabic writers: Saad Elkhadem, Naïm Kattan, Abla Farhoud, Wajdi Mouawad, and Hédi Bouraoui. The next five chapters all share a similar pattern: a brief biography and overview of each author’s work, followed by a closer critical analysis of a selection of works. This structural repetition avoids becoming tedious by varying and adjusting the number of texts and genres explored in light of each author’s oeuvre. Chapter Three, for example, touches on seven of Naïm Kattan’s works, including a trilogy and two collections of short stories; Chapter Five on three of Wajdi Mouawad’s plays; and Chapter Six on one exemplary novel of Hédi Bouraoui’s. Indeed, the wide array of forms and genre examined in Dehab’s study moves between – poetry, novels, short stories and plays – itself forms a sustained theme in her analysis, bringing into focus the challenge to traditional delineations of genre and literary form posed by several of these Arabic-Canadian writers. After introducing Egyptian-born Saad Elkhadem, and briefly recounting the themes of his two earliest novels, Chapter Two provides an insightful analysis of the tantalizingly titled, and “highly experimental” (53), Trilogy of the Flying Egyptian. It is interesting to learn the details of Elkhadem’s personal and professional life: that he taught at the University of New Brunswick, retired to Toronto, wrote in Arabic; that his books were banned in Egypt, were translated into English (not French), and were highly critical of Nasser’s regime. All of this provides insight into the thematic, stylistic and structural elements that Dahab teases out. As Dahab explains, Elkhadem’s works are “neither short stories, nor novellas, novels, diaries, or biographies per se, but reconstructions and deconstructions of elements of each” (32 and 63), and they demonstrate economy of style, multiplicity of language, and self-reflexive hybridity. Overarching themes of isolation and alienation result from and exemplify Elkhadem’s narrators’, protagonists’ and characters’ equivocal relationships with Egypt and Québec: “We arrived in 67, leaving Egypt humiliated and beaten and in ruins, and came to rich, lovely, joyful Canada” (Canadian Adventures of the Flying Egyptians qtd in Dahab 54), but the 1970 October Crisis, the War Measures Act, and the declaration of French as Québec’s official language alienate them in Montréal: “they hated us in Montréal. We can’t speak it. We don’t want to speak it” (Canadian Adventures of the Flying Egyptians qtd in Dahab 58). The chapter ends with a summative list of the features of Elkhadem’s writing, features that are shared with many exilic writers and that are posited here as part of his legacy to Canadian-Arabic literature. Chapter Three moves on to the motif of absence and the themes of exile and expatriation that suffuse Naïm Kattan’s writing. A prolific, award-winning writer, having produced thirty-four novels in thirty-six years and won the Prix France-Canada (1971), the Prix Anthanase David (2004) and the Grand prix Hervé Deluen (2007), Kattan has and continues to influence French and Canadian literature, as well as literary criticism through his contributions to La Quinzaine Littérature, Critique, and Le Devoir. Kattan’s first novel, described as “a portrait of the Artist as a Young Iraqi Jew Trying to be French” (69), introduces “the multiplicity of his cultural, linguistic, and ethnic make-up” (69) that mark all of his subsequent writing. Dahab attends to Kattan’s semi-autobiographical “transcultural, transnational” trilogy, comprised of Adieu Babylon, Les Fruits Arrachés and La Fiancée Promise, which resembles his own experience moving from a Jewish community in Baghdad to Paris to Montréal, while it “inscribes the beginnings, intentions, method and the life-long project of Kattan-the novelist” (70). Kattan’s writing is characterized by multiplicities of language–colloquial and literary Arabic, Hebrew and Yiddish, English and French, and dualities of discourse–fiction and autobiography, diaries and letters, public and private. It is through these dualities and multiplicities, Dahab argues, that Kattan resolves the problems of identity that are common to immigrant, exilic writers, achieving a “plasticity of cultural experience” (91). Québécois-Lebanese playwright and novelist Abla Farhoud is the subject of Chapter Four. Farhoud is notable as the first Arabic-Canadian writer to dramatize “the collective experience of immigration …. the communal experience of exile,” and “one of the first Québec writers to represent the experience of immigrant girls and women” (99). Having pointed out Khattan’s attentiveness to multiple languages in his work in Chapter Three, here Dahab identifies “five registers of language in [Farhoud’s] writings: Québécois slang (joual), standard French, colloquial French, English, colloquial Lebanese-Arabic and classical Arabic” (99), the uses of which, she argues, exemplify the postcolonial linguistic strategy of “othering” the dominant language, in this case French, to establish identity. “[S]yntactic calques” (100) are another stylistic feature of Farhoud’s writing–these literal translations of Arabic proverbs and colloquialisms further contribute to an “othering” of language. The experiences of girls and women, and the relationship between mothers and daughters are prominent in the examples of Farhoud’s plays and novels, such as Les Filles du 5-10-15 Cents and Le Bonheur a la Queue Glissante, that Dahab plots and parses. Death also preoccupies Farhoud’s oeuvre. Dahab identifies these subjects and Farhoud’s treatment of them as having universal resonance, and Farhoud herself rejects the label of “migrant writer”: “My writing is migrant to the extent that I am always in search of the elsewhere” (qtd in Dahab 128). Dahab argues that Farhoud’s diminution of her migrant experience is belied by the political themes that are implicit in her drama and explicit in her latest novel Le Fou d’Omar. Dahab closes this chapter with the conclusion that in Farhoud’s fictional world exile and the exilic are represented both literally and metaphorically. War is the central motif that is explored in the chapter devoted to Wajdi Mouawad. Also a Québécois-Lebanese playwright, Mouawad alludes explicitly to the Lebanese civil war, without ever naming it. The focus in this chapter is on three plays of a tetralogy: Littoral, Incendies and Forêts (the final play, Ciels, was not complete at the time of Dahab’s writing); particular attention is given to Incendies and the play’s horrific revelation. Mouawad’s success (like Elkhadem, he is a highly acclaimed and awarded writer) and his innovative style are noted; Dahab references the power of the so-called “Mouawad touch” and positions his plays within the “newly founded tradition of the théâtre engage of contemporary Québec” (138). As in the previous chapters, familiar stylistic elements and themes emerge from Dahab’s readings of these dramas; these include language play–in this case heavy use of the vernacular, québécois slang, and “highly scatological language” juxtaposed with the poetic and “a puissant ‘soufflé littéraire,’ or literary breath” (138)-; and the intersections between collective and individual experience. For Mouawad, “Exile and literature have always been linked” (qtd in Dahab 160), and as Dahab explains the exilic manifests in Mouawad’s work as metaphysical, and Kafkaesque. Chapter Six attends to Hédi Bouraoui’s La Femme d’entre les lignes [The Woman between the Lines] and is the book’s most theoretically complex chapter. Here Dahab engages Roland Barthes’s jouissance as she unpacks the “plurality, multiplicity, and diversity” (174) of Bouraoui’s writing. Bouraoui’s neologisms – “migramourir … amourir, livramour, migramouriant, amourliser” (189) – effectively exemplify the “double nature or reality of the human body and the literary text alike” (179) famously embodied in Barthes’s Leplaisir du Texte and demonstrated in Bouraoui’s writing. As Dahab contemplates Bouraoui’s themes and leitmotifs, she mimics his style, and coins her own neologisms, such as “amour-mots” (183), that exemplify, clarify and characterize his writing. “Transculturalism,” a term credited to Bouraoui (175), thematically mirrors his blending of words and genres, and presents a blending of cultures as “an alternative construct [of migrant experience] ranging somewhere between ethnicity and total assimilation” (175); this concept of exilic identity is enacted through the relationship between Marguarita Felice (Lisa) and the unnamed francophone narrator of La Femme d’entre les lignes, a relationship that for ten years takes place exclusively through letters, quite literally between the lines. Voices of Exile is an innovative and insightful investigation of a nascent field of scholarship, and is poised to become a seminal text in the study of Arab-Canadian writing. This book introduces readers and scholars of Canadian literatures to prolific, critically acclaimed, prize-winning Canadian authors of whom they may not yet be aware. Much of the work discussed here is also published in English translations, so it will be available – with the added complexities of studying work in translation – to Anglophone Canadian readers, but Dahab also provides practical and valuable translations of all titles and quotes used in the study. The book is heavily footnoted, which is obviously the publisher’s documentation style, but for such a thoroughly researched study the large number of footnotes (well over a hundred for each chapter) may be distracting for some readers. As Dahab explores major themes, motifs, and stylistic and structural elements in this emergent field of literature, she reveals “how it bears the mark of the political, the collective value of utterances, and the deterritorialization of language” (200). In her conclusion, Dahab notes the gender imbalance in this study of Canadian-Arabic writers, an imbalance that complements and counterpoints her previous work, Voices in the Desert: The Anthology of Arabic Canadian Women Writers (Guernica Press, 2002). As part of her attempt to open up this field, Dahab provides substantial detail about these writers, their works, and the implications of their individual expressions of the exilic experience of Arab-Canadian immigrants in Québec. The abundance and diversity of Arab-Canadian francophone literature that is encountered in Dahab’s study will undoubtedly inspire further research in this area, and may very likely result in “the canonization of the literature of Francophone Québécois writers of Arabic origin” (xii and 203). Veronica Thompson is Assistant Professor, English, and Chair, Centre for Language and Literature, at Athabasca University. She teaches Canadian, postcolonial and women’s literature. Her research interests include Canadian literature, Australian literature, postcolonial literatures and theories, and women's literature and feminist theories. She is currently working on representations of terror in postcolonial literatures.